In February 2014 a coup was carried out in Kiev, Ukraine utilizing violent Right Sector Neo-Nazis to overthrow the legitimate elected government of the country in order to bring it into the western sphere of influence and pull it into conflict and out of Russia’s orbit. 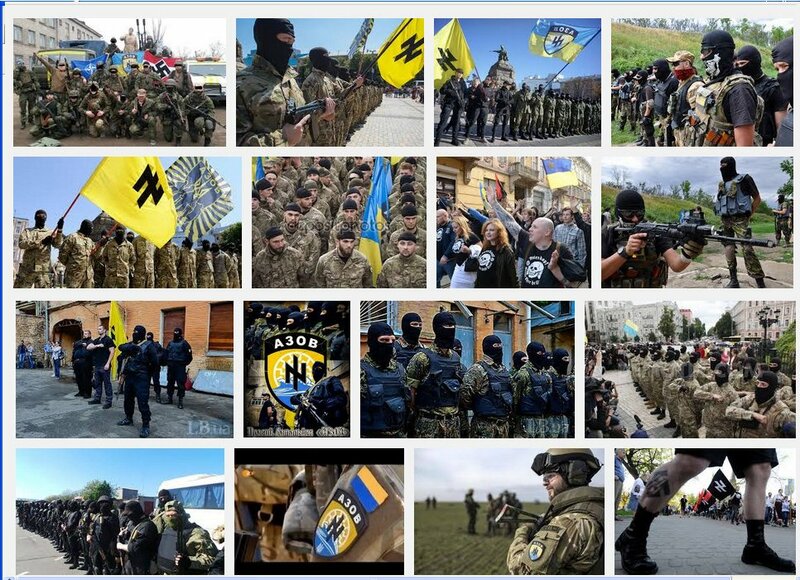 These Neo-Nazis groups were financed by Ukrainian oligarchs and directly supported by the United States government. The entire US media establishment went along with the false narrative on Ukraine by portraying these violent groups as legitimate peaceful protesters who were seeking freedom from repression, however, nothing could be further from the truth that the media intentionally concealed from the public. As reported by the UN, since February 2014, over 10,000 innocent people (the number is likely much higher) have been killed in the Ukrainian Civil War, the near entirety of the victims are ethnic Russian civilian men, women and children who have been bombed in their own homes by the Kiev regime forces supported by the United States and western powers. That illegal bombing continues to this very day and OSCE ‘observers’ intentionally obfuscate their reports to obscure that the Kiev forces who drove 400 miles east and are conducting this indiscriminate shelling of the civilian population. The Russian ‘invasion’ that the US media and western representatives incessantly ‘reported’ about for two years never materialized. They simply manufactured the narrative. If Russia did want East Ukraine the war for the eastern portion would have been long since over 2 years ago. The real invading army that is killing and terrorizing civilians is the one that came eastward from Kiev. The people of Donbass simply held two referendums to claim their own ethnic Russian state after the US backed coup. This fact has also been intentionally covered up by the entire US establishment media. After those referendums, the US State Department went on record as saying that the Kiev forces have the right to attack east Ukraine in order to maintain sovereignty. The US media has also intentionally never sent any reporters into the conflict zone to accurately report the fate of the 4 million ethnic Russian civilians living in Donbass. If they were to do so they would see that the actual Donbass rebels are primarily (85%) made up of local inhabitants. The remainder of the forces are international volunteers. The US media has also neglected to report on the 2 million ethnic Russian civilians refugees who fled TO RUSSIA. The fact that refugees sought safety with Russia is a definitive indicator of the fact that the Kiev regime forces were killing ethnic Russian families. The near entirety of the video evidence coming out of the war zone proves the aforementioned account to be true beyond any doubt regardless of any corrupt establishment media spin. I have personally compiled over 500 hours of video evidence related to the Ukrainian Conflict that highlight the misrepresentations by western media of the truth about the war. Using social media, first person videos and eyewitness accounts while working in collaboration with video compilers all over the world, I believe I have compiled the largest cache of videos related to the Ukrainian Civil War and I present my entire work below, as well as that of some of my fellow truth seekers in other countries. https://www.youtube.com/playlist?list=PLPXDAOv6gXa3Xsx-rKLYd0W1LvhjlwCTk Roses Have Thorns You Tube channel compilation of over 17 videos featuring 27 straight hours of translated video from the first 2 years of the Ukrainian Civil War. Watchdog Media Outlet is based out of Australia. https://www.youtube.com/channel/UCjImyHRZNF46KJ9UxCbab6A Schwelk You Tube channel covers all US State Department briefings on Ukraine and Syria for the past 2 years. My earliest DU threads on the Ukrainian false flags. These led to my being banned at the site after 10 years of membership. http://www.democraticunderground.com/10024616147 Ukraines grassy knoll (Graphic) evidence police weren’t the only snipers. http://www.democraticunderground.com/10024944357 Look at all those terrorists!!!!!! Evidence of the 1st Donbass referendum in May 2014. This is an important link as it shows clearly that You Tube has now removed all 9 videos of the referendum from 9 separate accounts. Those videos showed tens of thousands of people voting to separate from the new coup imposed Kiev fascist regime. http://www.democraticunderground.com/10024970928 Odessa Remembrance Service, covers the plebiscite and US AID support to Kiev. http://www.dailykos.com/story/2014/7/10/1312991/-Ukraine-nazis-Obama-and-hypocrisy – Compilation of early evidence that led to my being banned at Daily Kos. http://www.discussionist.com/?com=journals&uid=102027&page=20 Discussionist journal featuring over 150 Ukraine articles and over 80 videos between June 2014 and January 2015.
http://www.discussionist.com/?com=journals&uid=104265&page=39 Discussionist journal featuring over 350 Ukraine, Syria, Middle East and New Cold War articles and over 140 videos. The US media wall of coverup and deception of the Ukraine crisis is breaking down. The above media material proves beyond all reasonable doubt that the US government, media and western powers are intentionally lying about what has really happened in Ukraine over the past two and a half years. The fact that the US media continue to obfuscate and lie about these world changing events during the US election cycle also highlights that they have no respect for the American people and are continuing to deceive them on a massive scale. The American people and the world as a whole deserves better than this from our government and media representatives. For all these lies, all these crimes and all these deaths, people should be in jail, not continuing this horrific madness while continuing to foment more war and more false narratives. Its amazing and surreal to watch how things are playing out now in US politics in relation to all this insanity. Where it will all lead is anyones guess at this point. I knew when Ukraine was happening that it would be a good opportunity to highlight the US Deep States nefarious geopolitical actions on a grand scale due to the amount of video coming out of the the country and the ability to now fully use social media. I remember when Iraq was happening and there wasn’t anything like that video or social media wise, therefore many of us fighting to get the truth out had to rely on only a few sources for info. Back then it was a Republican administration fomenting the war but it caught me off guard when so many so called ‘liberal’dems were active in covering up the warcrimes of the Ukrainian Nazis and attempting to frame Russia for the coup and subsequent war that the US instigated. Thus, I now refer to them as faux liberals as real liberals would be anti-war first and foremost. For what they have given Obama a free pass for they should be truly ashamed. Cheers Doug, If you have any that you think are unique and worth posting up then I enourage you to still get them online at some of the Facebook groups like The Truth about the Situation in Ukraine or the IOUC (International Observatory of the Ukrainian Conflict). Cheers. Great work! Likewise I too have compiled videos since the beginning of the conflict. I was twice in the country. The last time being in April/May of 2013. In Kharkov for the last genuine May Day procession in 2013 witnessing first hand right-wing hooligan thugs attempts to disrupt that event. And in Kiev for the last ‘Victory Day’ processions. There in back alley ways and side streets I saw neo-nazis proudly displaying their insignia on t-shirts and the like. It disgusted me and contrasted sharply to the larger crowds there who came to cheer and commemorate the end of WW2 in Europe. Thanks Doug. I’m glad to hear your first hand account. It truly has been an eye opening experience seeing what the US and global elite orchestrated in Ukraine and Syria. Do you have the vids at a site as I’m still always looking for more material on Ukraine? You’re welcome. No sorry I don’t have my own webpage or site. All of the video footage I have are from downloaded files from various YouTube channels that are on one of my hard drives at home. My own personal catalogue so to speak.